Legions of loving and trustworthy archangels watch over us, and you can develop an even closer relationship with them by learning their names and specialties. In this uplifting nondenominational book, Doreen Virtue guides you in connecting with her 15 favorite archangels; and you’ll read true stories from people who received protection, miraculous healings, and amazing guidance from these beloved heavenly beings. Archangels want to help each and every one of you live healthier and happier lives. 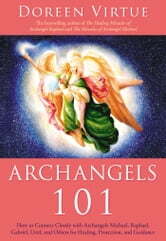 As unlimited beings, archangels can assist everyone simultaneously, and this fascinating book will teach you which archangels to call upon for various situations. Whether you’re new to working with angels, or someone who has believed in angels all your life, you’ll want to refer to Archangels 101 again and again.